Ryan has to cook a three-course meal for 100 people attending a charity dinner using only ingredients found in a McDonald's restaurant. His helpers are the students from the California Culinary Academy -- the same school where Ryan learned how to cook. Will Ryan be able to teach the students how to correctly plate his dishes so the meal turns out to be a success? 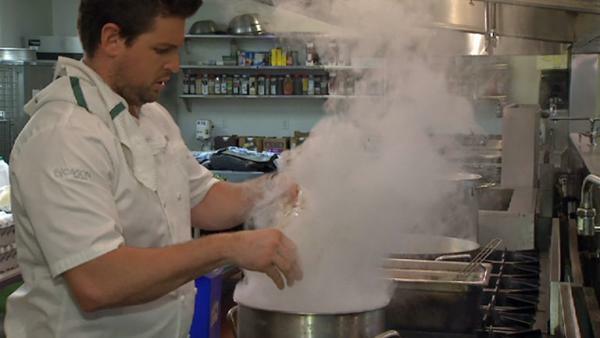 For Ryan's first course of his charity dinner, he is making a salad with soft poached eggs. He shares some tips for making perfectly poached eggs at home. Ryan is in the middle of cooking for his big charity dinner. He has to move the three course meal he's prepared from the Culinary Academy's fourth floor to their main dining hall on the first floor. This is the perfect salad to serve during the cooler months. This sauce is made with ground pork, beef and bacon. It's cooked low and slow in the oven for 24 hours. This is a great twist on the classic Italian potato gnocchi and it's a great way to use leftover hash browns. This refreshingly unique coffee drink pairs perfectly with any dessert. These mini beignets are crispy deep fried French-style doughnuts with a sweet caramel apple filling. The pressure is on for Ryan to finish the final two dishes of his three course meal he is making for a charity dinner at the place where he went to school, the California Culinary Academy.